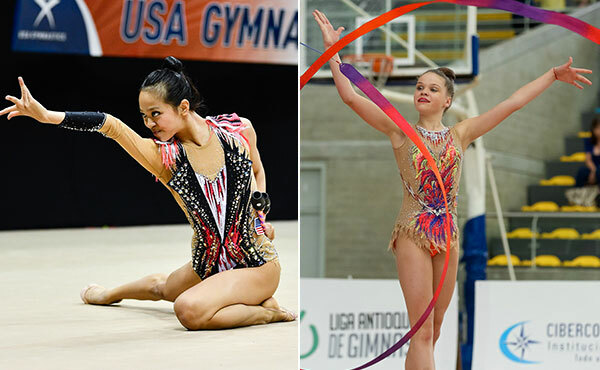 2016 Olympian Laura Zeng of Libertyville, Ill./North Shore Rhythmic Gymnastics Center, won the senior clubs and ribbon titles at the 2018 USA Gymnastics Championships at the Greensboro (N.C.) Coliseum Complex. 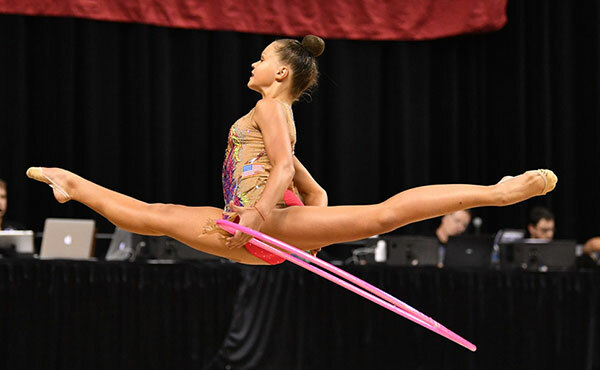 Elizabeth Kapitonova of Staten Island, N.Y./Isadora Rhythmic Gymnastics, successfully defended her junior all-around title at the national championships, which conclude tomorrow for acrobatic gymnastics, rhythmic gymnastics, trampoline, tumbling and double mini-trampoline. 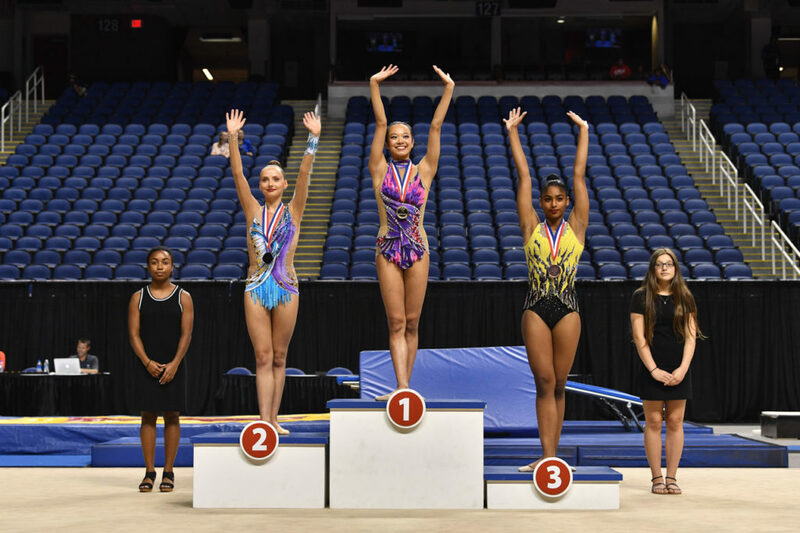 2016 Olympian Laura Zeng and Evita Griskenas won the senior U.S. hoop and ball titles, respectively, at the 2018 USA Gymnastics Championships at the Greensboro (N.C.) Coliseum Complex. Elizabeth Kapitonova, fresh off gold-medal performances at the Junior Pan American Championships and the Pacific Rim Championships, is in Greensboro defending her national championship from last year. She earned the U.S. junior ball and hoop titles Thursday afternoon. The last time we saw her compete in the USA was five years ago at the U.S. Trampoline and Tumbling Championships in San Jose, Calif. That was when she was Savannah Vinsant and a U.S. Olympian for the 2012 Olympic Games in London. 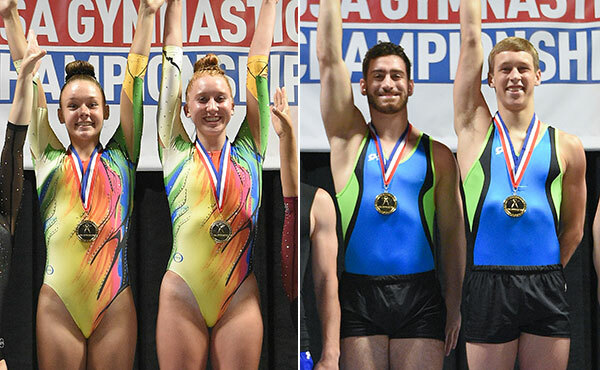 Olivia Simpson and Lexi Vigil; and Paul Bretscher and Cody Gesuelli won the women’s and men’s synchronized trampoline titles, respectively, at the 2018 USA Gymnastics Championships in Greensboro, N.C.
16-year-old Aisley Boynton is competing in acrobatic gymnastics at the USA Gymnastics Championship for the fifth year in a row. But there is something drastically different this time. 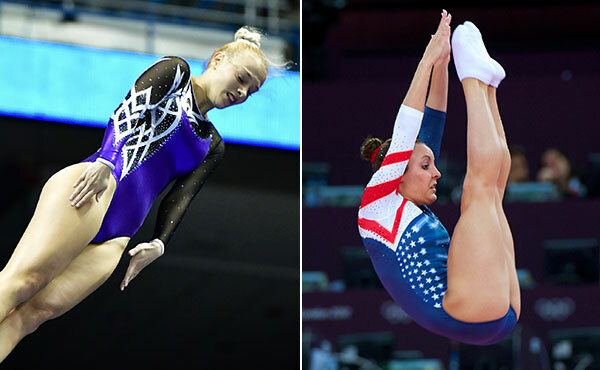 Three Olympians – Nicole Ahsinger, 2016 trampoline; Savannah (Vinsant) Thompson, 2012 trampoline; Laura Zeng, 2016 rhythmic gymnastics – are among the more than 1,000 gymnasts headed to Greensboro, N.C., to compete in the 2018 USA Gymnastics Championships. 2016 Olympian Nicole Ahsinger and 2012 Olympian Savannah (Vinsant) Thompson headline the field that includes four World medalists and five defending senior champions for the 2018 USA Gymnastics Championships, the national championships for acrobatic gymnastics, rhythmic gymnastics, and trampoline and tumbling. 2016 Olympian Laura Zeng is seeking her fourth-straight senior all-around title at the 2018 USA Gymnastics Championships, the national championships for acrobatic gymnastics, rhythmic gymnastics, and trampoline and tumbling. Elizabeth Kapitonova looks to defend her junior all-around title. 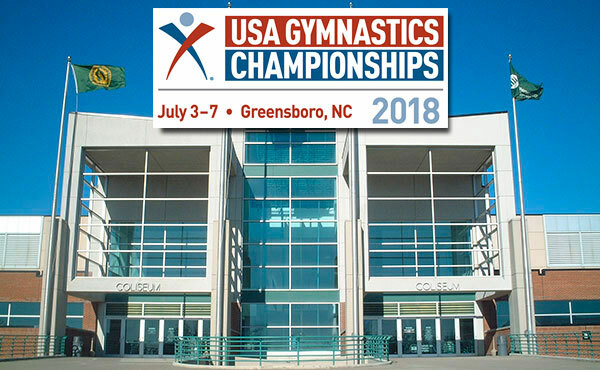 Tickets for the 2018 USA Gymnastics Championships, the national championships for acrobatic gymnastics, rhythmic gymnastics, and trampoline and tumbling, go on sale Feb. 9.